TOWLE® QUEEN ELIZABETH I 40-PC DINNER SET OF 8 FIVE-PC PLACE SETTINGS 80.70 OZT. 40-PIECE DINNER SET OF 8 FIVE-PIECE PLACE SETTINGS TOWLE® QUEEN ELIZABETH I. From it's beginnings on the banks of the Merrimack River in 1690, Towle Silversmiths have maintained an enduring tradition of fine craftsmanship in sterling silver and stainless steel flatware for over 300 years. This remarkable heritage is reflected in the outstanding character, magnificent detail, and incredible balance of every piece bearing the Towle® name. Crafted by an elite group of artisans, each piece of Towle is exceptional in quality, with a beautiful balance of form and function. The golden age of royal splendor and prosperity during the reign of Queen Elizabeth I inspired this pattern, introduced in 1970. With a stem of perfectly proportioned curving arcs and flowing lines, and a delicate flower motif at the tip and neck, the sculptured openwork forms the focal point of this regal design. The classic design is just right for every dining occasion and complements a wide range of decorating styles. 40-piece complete dinner set includes 8 five-piece place settings. 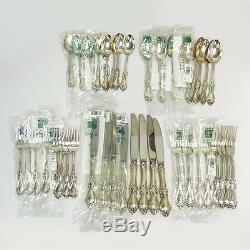 (8) Salad Forks 4 tine flat handle: Approx. Measurement of each: 6-11/16" long x 1-1/8" wide at widest point. Measurement of each: 7-7/8" long x 1" wide at widest point. (8) Dinner Knives hollow handle stainless steel blade: Approx. Measurement of each: 9-3/4" long x 1" wide at widest point. (8) Place Spoons flat handle: Approx. Measurement of each: 7" long x 1-3/8" wide at widest point. Measurement of each: 6" long x 1-3/16" wide at widest point. All pieces (accept dinner knives) Hallmarked/signed by artist: "Lion" Towle ® Sterling 1970. Tested positive for Sterling Silver. Other half of set (20 pieces - 4 of each utensil) is unwrapped and has been used. Use including tarnish and scratches. Excellent addition to any dining collection! Once all your auctions have ended, please request an invoice. Thank you in advance for stopping by and giving us a look! The Jewelry Box of Lake Forest. The Jewelry Box of Lake Forest has been voted Orange County's Best. Jeweler 5 years in a row! Fine, fashion & bridal jewelry. INTEGRITY is what The Jewelry Box of Lake Forest is all about. The store has been in the same location for over 20 years, Master Goldsmith Oscar has been the lead jeweler here for over 20 years and Christine and Jack are enjoying their fifteenth year as owners. All jewelry and watch repairs and re-stringing are done on the premises by our master jeweler and watch maker. You'll enjoy the friendly, informal no-pressure atmosphere as you browse a fantastic selection of fine and fashion jewelry and watches or talk about custom design or repair. We look forward to seeing you soon. After your experience, you'll be recommending The Jewelry Box of Lake Forest to your friends, too. The Jewelry Box of Lake Forest will give you a 10% discount on any repair work when you bring in a non-perishable food donation for South County Outreach's Food Bank. We'd be happy to help! The item "TOWLE QUEEN ELIZABETH I 40-PC DINNER SET OF 8 FIVE-PC PLACE SETTINGS 80.70 OZT" is in sale since Wednesday, March 02, 2016. This item is in the category "Antiques\Silver\Sterling Silver (. The seller is "thejewelryboxlakeforest" and is located in Lake Forest, California. This item can be shipped to United States.